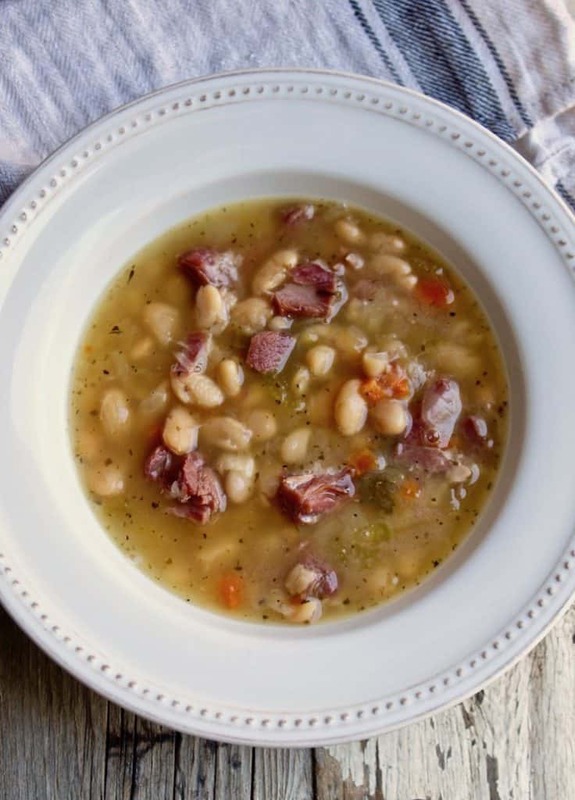 Smoky ham and white bean soup made easy in the Instant Pot, no need to presoak the beans. I think my favorite thing to make in my Instant Pot so far, has been soup. I’ve made a lot of soups and my pressure cooker is my go-to for making chicken stock (or bone broth, if you prefer). 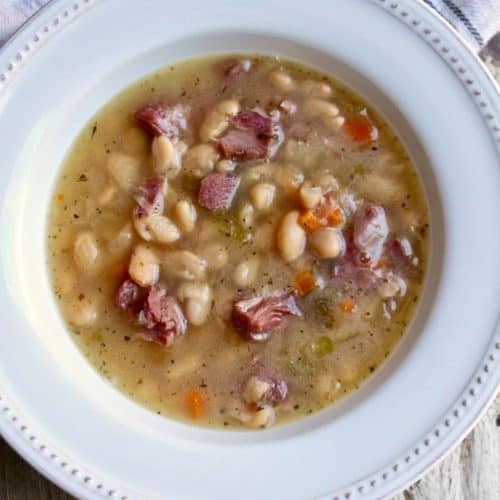 Instant Pot Ham and White Bean Soup is so easy and so good. We love it. I used to never make soups from dried beans because I was always turned off by having to soak them overnight. Don’t have to do that with the Instant Pot. I didn’t and they were perfectly tender. I wanted cannellini beans, but couldn’t find dried, so I used Great Northern beans, which is probably the preferred white bean to use anyway. You need a one-pound bag of beans. I flavored the soup a couple different ways, each time I made it. I like fresh rosemary and thyme (or dried) a lot. I also like herbs de Provence. Whatever you got and like. And a bay leaf. That’s it. Well, along with the onion, celery, carrot and garlic, that’s it. It all goes in the Instant Pot and you can walk away while it does all the work. While the actual cooking time is about 35 minutes, it takes awhile to reach pressure as well as naturally release the pressure. Count on about an hour and a half, start to finish. 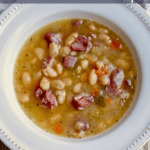 If you’ve tried this Instant Pot Ham and Bean Soup or any other recipe on the blog, then don’t forget to rate the recipe and let me know how yours turned out in the comments below ~ I love hearing from you! You can also FOLLOW ME on FACEBOOK, TWITTER, INSTAGRAM and PINTEREST to see more of what I’m cooking in my kitchen and recipes. Never miss a post ~ sign up for The Hungry Bluebird Newsletter for a weekly email of new content. 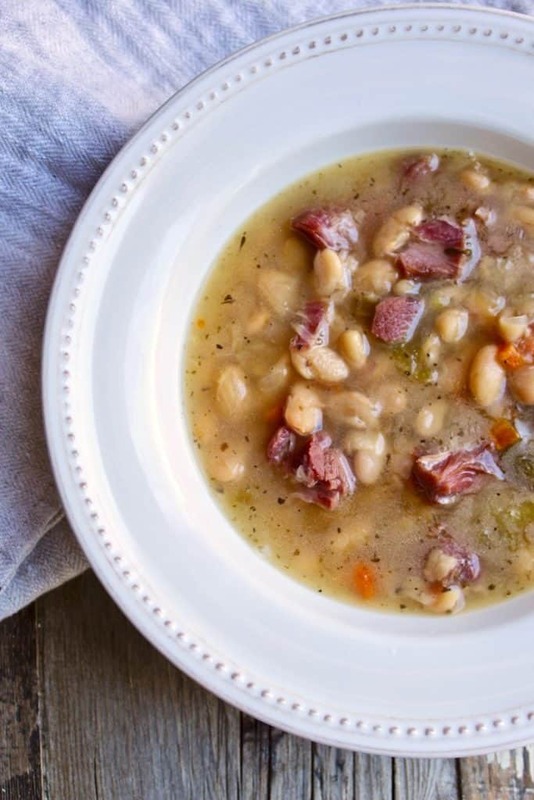 Smoky ham and white bean soup made easy in the Instant Pot. Turn Instant Pot on sauté setting and heat olive oil in insert. I use the medium heat setting for sautéing. Add onion, celery and carrots and sauté until starting to soften, a few minutes. Add garlic, stir a few seconds until fragrant, then add herbs and bay leaf, stir and turn off sauté function. Add the dried beans to the pot along with the ham shanks. Pour in 8 cups of water and combine gently. Toss in 2 sprigs of parsley. Close lid and seal pressure cooker. Cook on high pressure and set timer for 35 minutes. It will take about 25 minutes to reach pressure and then the timer will start. When finished cooking, let pressure naturally release for 20 minutes. Manually release any remaining pressure, carefully open pot. Remove ham shanks to cutting board and shred/cut meat into bite-sized pieces. Add back to soup and season with kosher salt and black pepper to taste. Ladle into bowls and serve with a little hot sauce on the side. If the beans aren't tender enough, remove the ham shanks and cook for another 5 minutes under high pressure, release pressure manually and continue with recipe. Your soup looks delicious, on the line up for this week. Making your IP Country green beans and potatoes tonight. Thank you for sharing. We love pho ga and its so easy in the pressure cooker. Hope you like the Country Green Beans ~ I just made it for Sunday supper with some skillet cornbread, delish! Full of flavour and easy to pull together. Thanks for this recipe! Best bean soup ever! And soooooo easy. I’m so glad you liked it, we think it’s the best! AMAZING! 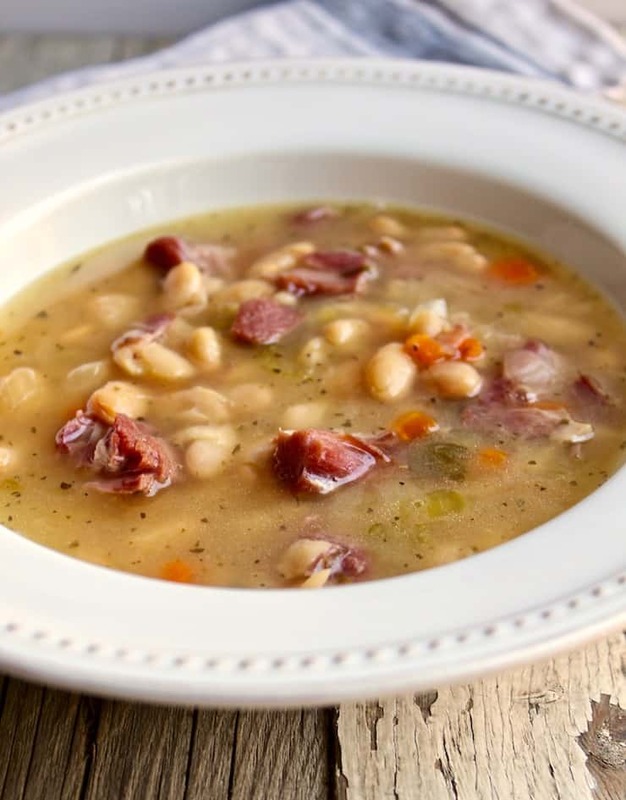 I’ve been craving white bean and ham soup. I threw this together last night and walked away to do some sewing. Boy did I have a wonderful dinner waiting for me downstairs. Thanks for a great recipe. I am a fairly new Instant Pot user but this recipe was really easy to follow and it turned out really, really tasty! I will definitely be making this recipe again! Very yummy! Hi Kelly – Excited to try your recipe! 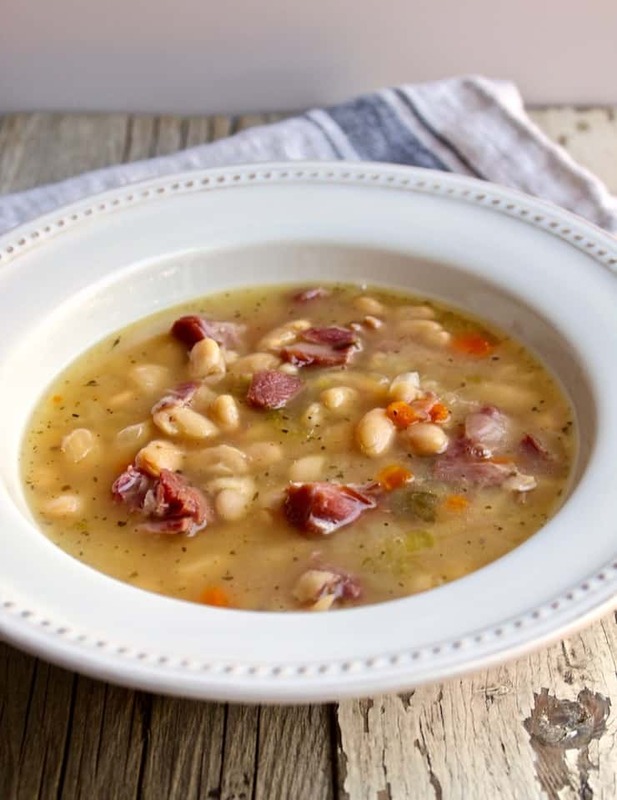 The family is looking for a thick “southern style” white bean and cornbread supper. Do you recommend I reduce the amount of water or add a thickener? It thickens up upon standing but you could do a quick release of the pressure, that will thicken it, too. I don’t think you need to add a thickener. This was amazing! First recipe I made in my Instant Pot. The only thing I did differently was 4 cups chicken broth/4 cups water. Chicken broth is good!! Glad you liked the soup. This soup was amazing! I decided to add some fresh kale at the end. I just stirred it in before we dished it into our soup bowls. It added a new color and it was yummy! I changed a few things but not much. I have an 8qt instant pot so added 10 cups of water instead of 8. I chopped up about 1.5 lbs of ham and also used the ham bone. Added an extra carrot as we enjoy veg. The Herbes de Provence was so good in this! One of the best out of the gate Instant Pot recipes that we have tried. Making this tonight! I’m confused on if this recipe is for beans that have been quick soaked or only rinsed. 2 tablespoons of rosemary and thyme each or combined? I want to pre soak beans overnight for health benefits so how would that change the cooking time ? Thanks ! Question. Would you recommend replacing the water with chicken broth? or would that be too much? You could use chicken broth if you want, it would be very good, I’m sure. I find the ham and seasonings are enough for a very flavorful soup. This soup is outstanding. I just got my Instant Pot and this was the second recipe I ever made in it. I sautéed 6 onions and left out the carrot since I didn’t have any. I also added more garlic than I care to admit 🙂 I used Herbs de Provence and rosemary as you suggested. Your instructions were super helpful for a first timer. I think this is the first scratch-made soup I’ve ever made that I actually enjoyed. If anyone else doesn’t love the texture of whole beans, I stuck my immersion blender in the pot after it was done cooking and it was still spectacular. Thank you for this recipe!! This was delicious. I made two changes. Used navy beans and omitted the rosemary. Cook time was perfect. Just made this and it really does taste delicious!! I used 6 cups of chicken broth and 2 cups of water but other than that followed the directions exactly! Was a hit and this recipe is definitely a keeper! Thank you!! I made this recipe and put the insta pot on for 75 min with the stew button after pressure was built, than let pressure out and the beans are not cooked. I just put the pressure back on for soup for 35 more minutes. I have to wait for the pressure to come again and than the 35 min starts. Why is my batch taking so long? I use the high pressure setting, not the stew setting, that could be why. So my house smells terrific. But my beans were not fully cooked. The only change i made was 4 cups of stock and 4 cups of water. I’m on high pressure in the 6 quart Instant Pot Duo. Its my first time doing dried beans. I’m certainly up for any thoughts. A lot of the liquid was absorbed, so I added 4 more cups of water and am running it for another 15 minutes. I’ve made this soup several times in the Ultra under high pressure and 35 minutes is enough time. I let it naturally release for about 20 minutes and I don’t salt the beans. Not sure why it’s taking longer for you but there are definitely variables. Maybe 40 minutes is a better time in your model? Hope it eventually turned out for you. I bet your house smelled divine! I also cooked this on high pressure in the 6 quart Instant Pot Duo (for 40 minutes), and the beans were still pretty hard. I followed your instructions for the 20 minute natural release after the 40, then released the steam. I removed the ham, and cooked the beans for another 15 minutes (with quick release), and they were still not done. Any thoughts? Not sure why, mine always cook in the stated time. I’ve read that the age of the beans matters, that could be a possibility if the beans are on the older side. They should have been cooked and tender in the time you stated. Also, salting the cooking water can toughen beans. I’m stumped, sorry. This was really good. Couple subs (1) used 2 smoked ham hocks and an 8-oz slab of ham, diced; (2) used 4 cups low sodium chicken broth and 4 cups water. Mine was perfect after 35 minutes with 20 minute rest. Very, very good, filling and comforting. Leftovers for lunch! It takes awhile to figure out Instant Pot cooking, I definitely don’t like everything in the IP. This soup, though, is a favorite. I’m glad you tried it and liked it. I’m new to the instant pot. Why do you have to wait for it to natural release instead of quick release? To continue cooking the beans and when you manually release, the contents boil vigorously and I like the soup more on the brothy side. That said, the soup does thicken up a bit upon resting. Just got my Pot this week and love this recipe! Served it with homemade biscuits just the way my mom did growing up in Michigan. I used 4 cups of low sodium chicken stock and 4 cups of water.